Nintendo Switch players will be seasoned veterans by the time they reach Octo Shower, the fourth boss battle in the ink-slinging shooter Splatoon 2. With a host of experience and various weaponry at their disposal, inklings would be correct to assume that the Octo Shower is going to put up a considerable fight. Fortunately, there are a few key strategies that make a breeze out of defeating the baddie unlocking the final stages of the game. Continue reading to discover how to flatly embarrass the Octo Shower boss in Splatoon 2. The Octo Shower stands alone amongst Splatoon 2's bosses for one simple reason: difficulty. 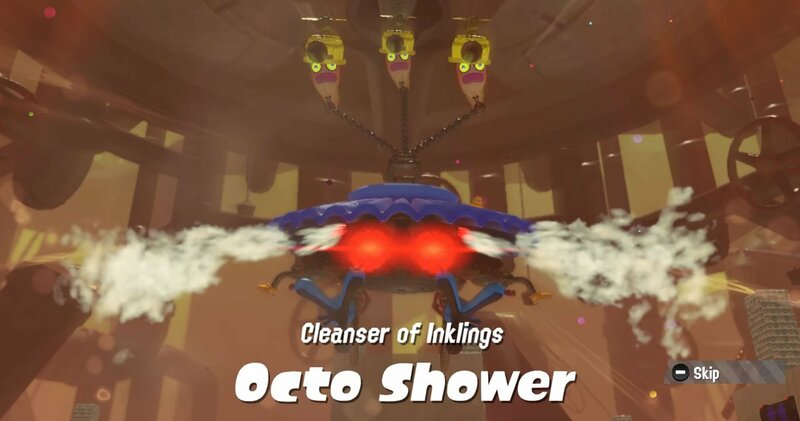 Right out of the gate, the Octo Shower will begin attacking the player, using Octarian Octocopters to keep itself mobile as well as its ability to zero in on the player with its targeting laser. This boss does have one big tell: it leans backward before it fires its massive cannon, so when players see a tilt, know to make a run for it. Beyond that, the first real step to defeating this boss will be taking out the Octarians, so move quickly or climb one of the nearby towers and use charged Hero Shots to pick off the Octarians. With a bit of luck and speed, all three can be eliminated rapidly, and players can take two more fully-charged Hero Shots at the Octo Shower's exposed tentacle. With stage one complete, the Octo Shower will regenerate four new Octarians to carry it around. In addition, he'll bolster is offenses with a new Ink Shower attack as well as a set of homing missiles. Players will want to strafe around incoming attacks, being particularly careful to avoid missile fire, and once again take out the Octocopters. Climbing to a high vantage point helps with the Octarians, but may leave players with fewer options for dodging incoming attacks. Play it however feels best, and once the Octarians are down, use charged Hero Shots to once again destroy the Octo Shower's tentacle. At this point, the Octo Shower will be less happy than ever, bolstering his defense with Octocopters that are able to dodge incoming attacks as well as machine guns that can make short work of the player. Fortunately, the offensive strategy is still the same as ever: dodge incoming attacks, climb to high vantage points, and take out the Octocopters using whatever means necessary. When Octo Shower plummets to the ground, use fully-charged Hero Shots to destroy the tentacle and end the Octo Shower's ugly reign once and for all. Looking to conquer everything that Splatoon 2 has to offer? Head on over to Modojo's Splatoon 2 guide hub, where we've featured a number of lists, how-tos, and essential boss strategies.